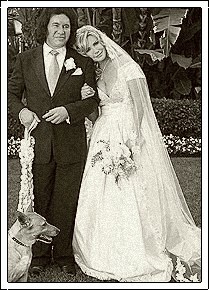 … their wedding took place on Oct 1, 2011, at the Beverly Hills hotel. KISS bassist Gene Simmons has been with his girlfriend, Shannon Tweed for a sometimes turbulent, but mostly tenacious 28 years, before he finally tied the knot. The bride wore an ivory Priscilla of Boston gown and carried a bouquet of ivory garden roses as she walked down the aisle. — one of three dresses she chose for the big occasion. She later changed into a Badgley Mischka dress for the reception.